Share Expy Multimedia: Change Of Date For JAMB UTME CBT Candidates – Confirm yours today! Change Of Date For JAMB UTME CBT Candidates – Confirm yours today! 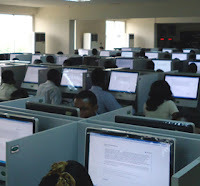 Due to clashes between WAEC Examination dates with Computer Based Test(CBT) dates, The CBT examination is now between May 18th to June 1st, 2013. We shall send SMS and Email to the affected candidates. Candidates are advised to reprint their Registration Slips from April 18th, 2013 to know the new dates. All candidates who fall into the CBT category are advised to recheck their exam dates and re-print their photo-cards from their registration point or the official JAMB website. Though there are slight changes to date for CBT, the Pen and Paper Test (PPT) version is left unchanged and will hold on 27th April, 2013. If you are a CBT candidate, recheck, confirm and print your photocard, it does not cost you anything. if you cannot confirm yours now, send us an email with your UTME 2013 details and we check it for you.